Over the weekend I met up with Patrick Lin, a former student of mine from ZUCC in Hangzhou. It’s hard to believe that it’s been over 10 years since I first taught him English all those years ago. At the time, I was a 22-year-old kid fresh out of college, and the students in that class were 21. Now he’s married and has a kid already. After college, Patrick went to Scotland and studied golf course design. He later moved to Beijing, where he applied what he had learned for a while, but apparently got the entrepreneur’s itch and opened a coffee shop in Beijing. (Lesson learned: don’t start with a big coffee shop.) 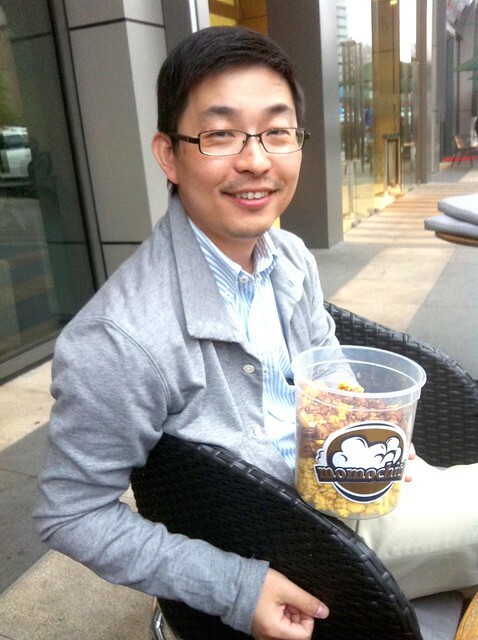 Later he decided to open a business in Shanghai selling gourmet popcorn under his own brand called Momochitl. Anyway, this past weekend I finally made it out to Patrick’s shop and got to try some of his popcorn for myself. It’s imported American corn and ingredients, and it’s good stuff! You can even order it on Taobao if you’d like to try it. I’m proud of a former student for starting his own business in largely uncharted territory. He’s got all kinds of ideas for his business, and I’m interested to see how it grows. “The earliest word for popcorn!” Nice. If you Google “momochitl,” you’ll find that Patrick’s business is already overtaking the search results, but one interesting page is simply the Wikipedia page for popcorn, in the Nahuatl language. Nahuatl is the modern term for the family of languages descended from the Aztecs. Interestingly, Patrick is marketing his popcorn mostly under the name Momochitl, but if you insist on Chinese, it’s 蘑球 (“mushroom balls”??). 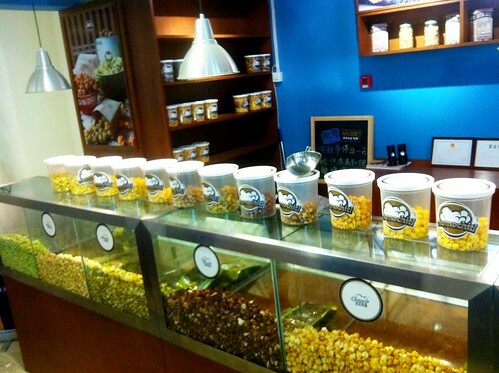 If you like popcorn, give it a try! For the first time in two years, Greg is no longer a teacher at ZUCC in Hangzhou. His plane left Shanghai today at 12:45pm. Greg plans to come back to China. In the meantime, he will be missed. P.S. Greg may not be living in China anymore, but he still has lots to say about his experiences here. So don’t forget to check Sinobling from time to time. I just attended my friend John’s wedding over the weekend, in Changchun, China. Changchun is pretty far north. It’s north of North Korea, and probably the farthest north I’ve ever been in China. It was a great time to be there; I got to trade Shanghai’s sweltering August heat for Changchun’s crisp early autumn weather. Not a bad deal. The wedding was nice. It was the first Chinese-style wedding I’d been to for one of my non-Chinese friends. Despite all the horror stories of Dongbei baijiu chugging I’d been fed, the drinking really wasn’t too bad. Yeah, a few of my old ZUCC buddies were ensnared by the evil stuff, but I think they wanted to be martyrs. Or to have baijiu horror stories to tell. Or both. I was also asked to play interpreter for John’s parents, as most of the ceremony was in Chinese. I was happy to do that, of course, although I felt a little unqualified. Interpretation is hard work! Fortunately, what I was translating into English was not too hard: the host’s good wishes for the happy couple, the bride’s father’s speech to the guests, and even John’s speech in Chinese. It was an honor to be the one translating John and his bride’s love story for his parents, but I had to choose my words carefully. The emotional effects of my every word were plainly visible on his parents’ faces. What I wasn’t exactly prepared for was to interpret John’s father’s speech into Chinese for all the Chinese guests. Fortunately, he had it written out and let me take a look at it beforehand. It was written in a straightforward way that could be translated without loss of emotion even by an amateur like me. The crowd liked the speech. No one threw tomatoes at me. All in all, a very fun, interesting, educational experience. It’s the 4th of July. Ever since living in China (and especially since having stayed at ZUCC, unofficial random meaningless fireworks capital of Zhejiang), fireworks are about as special to me as chopsticks. They’re really no big deal at all for me. And I’m normally not one to reflect much upon the meaning of “freedom” or independence from colonial rule on this day. The good news in these dark times is that the new Adopt a Blog is coming along. So is the new China Blog List. More news on that soon. I’m in the middle of my “Labor Day” week of vacation, and enjoying it immensely. I am no longer sick, and have managed not to pick up any more pets. I’m working on my site and working on my book (that will be published some day!). And now Carl and Jamie are visiting from ZUCC. his trusty camera at his side. he leaves photo galleries in his wake. No, I’m not talking about Hangzhou’s recent hydrofluoric acid leak, I’m talking about the arrival of Jamie Doom (of Doom in China fame). I finally got to meet the guy last night. He was passing through Shanghai on his way to Hangzhou, where he will soon be a teacher at ZUCC. First I’ll say that he was exactly as I expected his to be from his blog, and that’s a compliment. He was friendly, funny, up for a good time, and he looked like he does in his pictures. I sort of did a repeat night out that I did with Amy, Carl, and Greg a few weeks ago: all you can eat and drink teppanyaki at Da Yu, followed by merriment at Excalibur Rocks. It did the trick. I was a little disappointed by the initial lack of gusto on the parts of the eaters. When it’s all you can eat and you’re shelling out a pretty penny, I expect people to eat all they can eat. Those fools actually needed reminders! Same goes for the alcohol! It wasn’t long before Jamie was catching up with (and surpassing) me on the drinks, though, and Russell made a valiant effort too. By the time we got to Excalibur Rocks we were all pretty happy. Highlight of the evening for me was watching Jamie do a solo dance on the floor with two hula hoops. I’m not sure if he even remembers it, but I was dying laughing at the time. 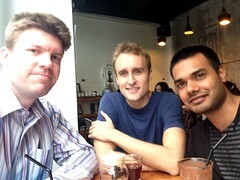 It’s always interesting to meet these bloggers. People choose what parts of themselves to expose in their blogs, but when you actually meet face to face, you get the rest. I think every blogger has tons of good stories he doesn’t want to write about on his public blog. Anyway, good luck in Hangzhou, Jamie. We’ll meet again…. Happy New Year, everybody. It’s been a while since my last entry, I know. In the meantime a lot has happened (although really, not much). I have completely moved into my new apartment in Shanghai, and it’s awesome. My ZUCC co-worker friends were all going to help me with the final move, but they all bailed on me at the last minute for lame reasons like “no money,” except for Greg. He was a great help, and strong as an ox, that lad. Alf tried to placate me by later showing up with a potted plant for me. What a charmer. Anyway, I don’t hold grudges, so I’ll be happy to put any of them up should they feel like coming to visit me in Shanghai. Those guys are great, and I’ll really miss them. Sometimes it’s hard for me to explain even to myself why I would voluntarily leave such a great community of people. I also met the notorious Brad (of BradF.com) recently. Very chill guy. Much more into music than I expected (if you read Chinese, make sure you check out his ideas for his new band!). Hopefully I’ll be hanging out with him again soon. I finally bought a new hard drive yesterday. 80 GB of Seagate goodness. Works like a champ so far. I’ve actually found that I didn’t lose as much data as I thought I did, due to my inadvertently backing important documents up in the past for various reasons. That includes my book, to my extreme relief. My publisher has just recently informed me that they’ve finally made the official decision to publish it. Cool. Only took 3 months. Hmmm, every paragraph is beginning with the word “I”. But not this one. My ADSL internet access will be installed tomorrow, and then I can finally quit with this internet cafe hanky panky. I paid a huge wad of cash for my apartment on Christmas Day. My new job doesn’t start until after Chinese New Year. I was getting paid very little all last semester because I was teaching very few clases to make time for my full-time Chinese studies. That all amounts to me being pooooor. My older sister Amy is coming for a visit next Wednesday. Fortunately she’s bringing funds. Everything’s gonna be cool, I’m sure. Things are looking good. I have lots of ideas for Sinosplice in the months to come, but I’m gonna need that internet access first. Expect more pictures. My new surroundings have imparted new inspiration to me.